I got Diesel as a four week old puppy. During his time as a puppy I was at an all time low. I did not want to get out of bed or eat, I had just given up. He would get behind me in the bed and push me to get up, he would push his food bowl between my feet as to say “Momma you need to eat”. I took my son (Diesel) with me everywhere I went. If he couldn’t go I didn’t go. We went grocery shopping together, to the car wash together. But when I got home he would never leave my side. His birthdays were spent with plenty of cheeseburgers, fries and yes, cake. Those were his special days. Being able to have him for 14 years has been one of the biggest blessings in my life. Had it not been for him loving me when I couldn’t even love myself I surely would not be here today? Diesel has not only been my dog, but he has been my son’s dog, my best friend, my protector, and most importantly my life saver. Diesel has been a big brother to my 3 daughters, been their protector and loved them through sickness and heartache. 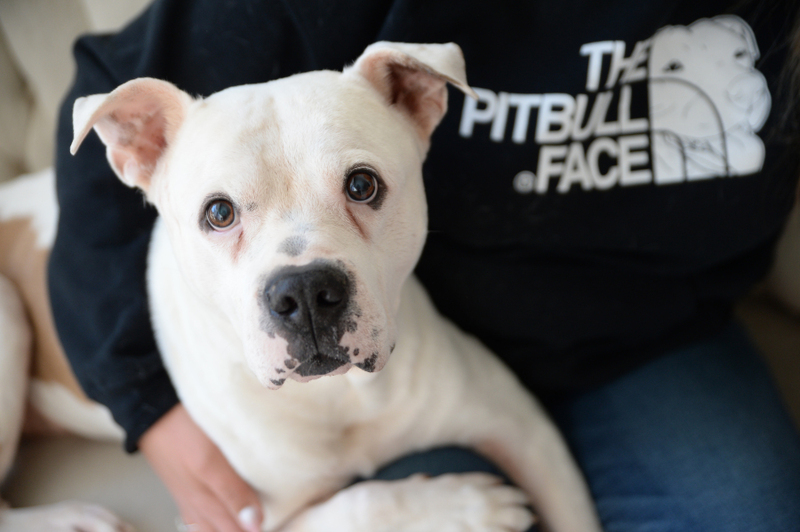 Diesel started what has now turned into a mission of ours to save Pit Bulls. He has 15 pittie brothers and sisters and he cares and loves each one. While 14 years with me was nowhere near enough there is no doubt that he will be sitting at the Rainbow Bridge waiting on me. My heart is truly broken and may never be whole again but I am thankful for everyday God gave me with him. He was the true definition of a gentle soul, with a love bigger than the heavens for his family. Our world is rocked and we ask that everyone remember us in your prayers. Pit Bulls are a wonderful, caring, and compassionate animal that will lay down their life for yours. If this compels you, please consider donating to your local animal shelter or a Pit Bull Rescue. No amount is too small when saving a life. Diesel sure spent his whole life saving mine.